What makes The Son-Rise Program® Developmental Model unique is its comprehensive focus on social development. Autism, at its core, is a social-relational challenge for our children. When we can see, track, and achieve social-relational goals, we open the door to our children truly connecting with people, making friends, expressing love, enjoying people, communicating what’s important to them, showing genuine interest in the thoughts and feelings of others, picking up on social cues, sharing interests, showing affection, and participating successfully in the world. 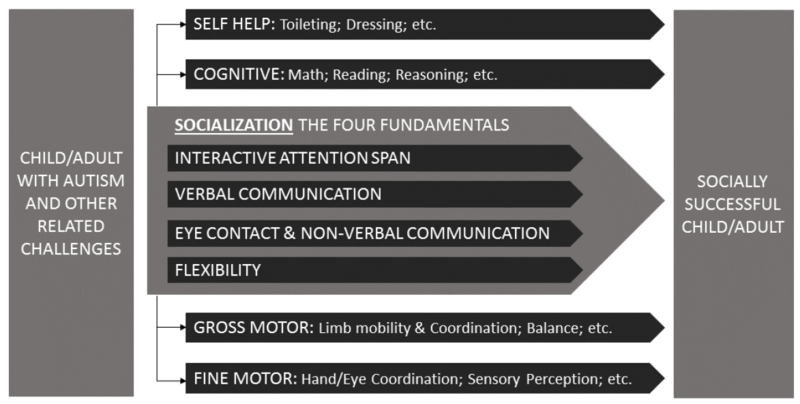 The Son-Rise Program® Developmental Model helps you to plot your child and set goals in the Four Fundamentals of Socialization (see below). In each of these areas, you will be able to track your child through the five stages of development. We are so excited to give you the tools to pinpoint where your child is socially and to create curriculum to enable your child take their next social developmental step - and all the steps after that!